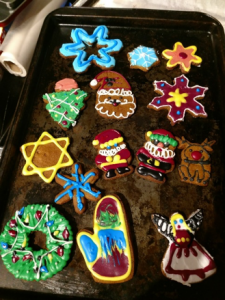 We are in December and only a few weeks away from the most wonderful time of the year! Nowadays, it has also become one of the most intense and time-starved time of the year as well. 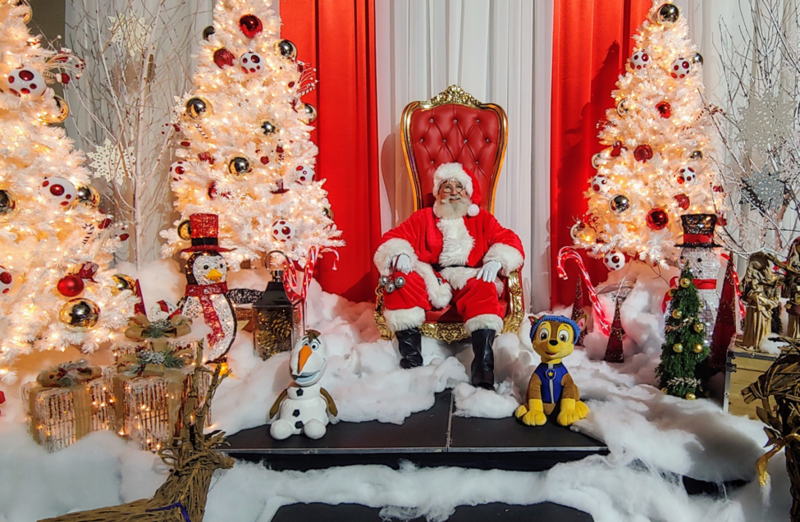 Stage Entertainment has a fantastic complementary service to our Santa Claus and seasonal performers. 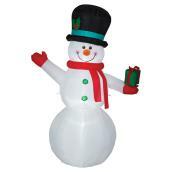 We are offering Christmas Decor. 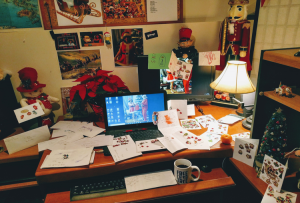 We recognize as working professionals, sometimes there isn’t enough hours in the day with the added planning for Christmas parties and coordinating all the little details. The hectic December schedule is why we offer this service to help out all of us for six weeks of the year. Nobody wants to own and store all of this Christmas decor for a one day party or even a month-long display. We store it year round, and you can rent what you need when you need it. Here is what we have to offer your Christmas party or event. 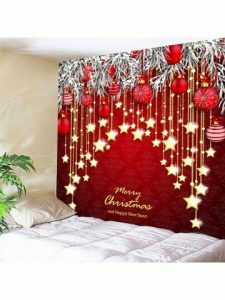 Call Stage Entertainment to take the stress out of your Christmas decorations for your office Christmas party and family events! It twas a month before Christmas. Ho, ho, ho and joyful seasons greetings from me: Saint Nick, Sinterklaas, Santa Claus, whoever you know me by; to all the worlds wonderful children, as well as those of you who are still children at heart. The recent weather well south of my home in the North Pole has been, shall we say, ‘strange.’ At first, it’s unusually warm; making me very uncomfortable in my heavy suit. Then it gets extremely cold; which is just how I like it. Then it snows, which is even better; only to be followed by rain, not at all appropriate for this time of the year. Up here in the North Pole, it’s always dark now and constantly cold, just as it should be for this time of year. Why for the rest of the week our local elf weather station says, it’ll be a comfortable minus 25 Celsius. 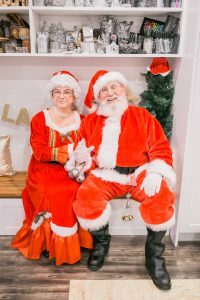 This week, I had the wonderful pleasure of being accompanied by Mrs. Claus as we attended a happy event in Woodbridge Ontario. Here’s a picture of the two of us. We both agreed on our way back to the North Pole that this families home was wonderful, festively decorated, making us feel right at home. 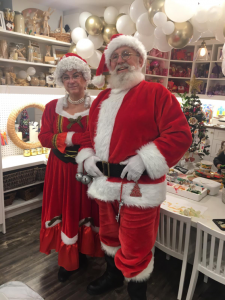 Some of you have been asking me what Mrs. Claus and I do after Christmas. Well, we go on vacation like so many of you, and your families do. Even our elves go on vacation. Why, last winter, we thought we’d go to Florida in the United States of America. I do love swimming; which is difficult to do up here in the North Pole, even during the summer months. I also started exercising on my elf-doctors advice. He told me if I wanted to live past two-thousand years, I had to start eating healthier – fewer cookies, candies, eggnog – as well as get more exercise. At least he didn’t forbid me from having milk and chocolate chip oatmeal cookies (my favourite) during my Christmas night delivery run. Anyway, the elves and I put up a small gym at the back of the workshop so during breaks we can all take the opportunity to get some additional exercise. Magic is a wonderful thing, but it can only do so much. We all still have to take responsibility for our health, if possible; I can’t merely wish myself to be fit and healthy or smart and rich. 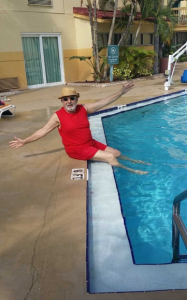 Below is a couple of pictures of me at a pool in Florida and on the treadmill…lots of walking but going nowhere! And as you can see, my favourite colour is always red, ho, ho, ho. Now, have any of you seen the new Christmas movie yet that’s on a channel called Netflix? It’s titled The Christmas Chronicles, and it stars a wonderful actor named Kurt Russel. Mrs. Claus and I watched it the other night. She was quite amused by how the elves were depicted in the movie, but regrettably, some of our real elves were not! They thought the movies elves more resembled Gnomes or Gremlins than actually resembling them. I had to reassure our elves that Hollywood always takes ‘license’ with stories and characters to make a story more entertaining. 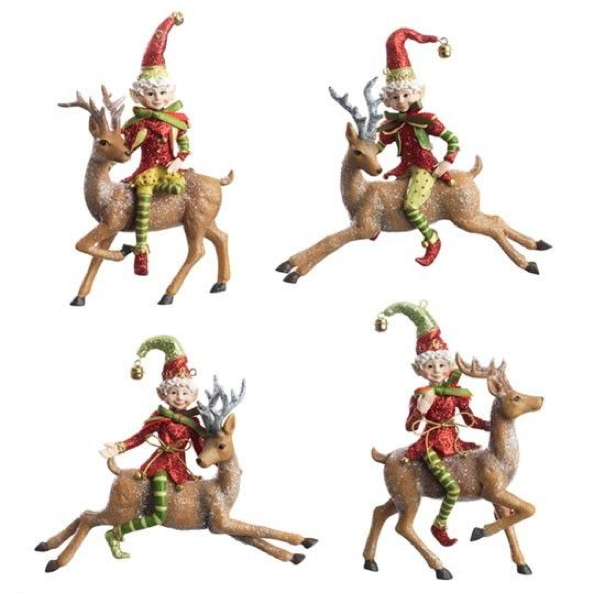 But I do see these elf figurines’ being manufactured in our workshop in the not too distant future. They were adorable when they weren’t angry. Now that I think about it, they did resemble gremlins. As for Mr. Kurt Russel, I can still remember, so many years ago, when he was a young boy on Disney’s The Mickey Mouse Club. He was a Mouseketeer. My oh my, he’s come a long way. 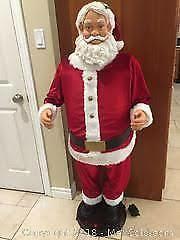 Now he’s portraying me, Santa Claus; only different, ho, ho, as I would’ve looked and dressed perhaps one-hundred and fifty years ago. I think I still have that style of clothing and furry coat in one of our many wardrobe closets. 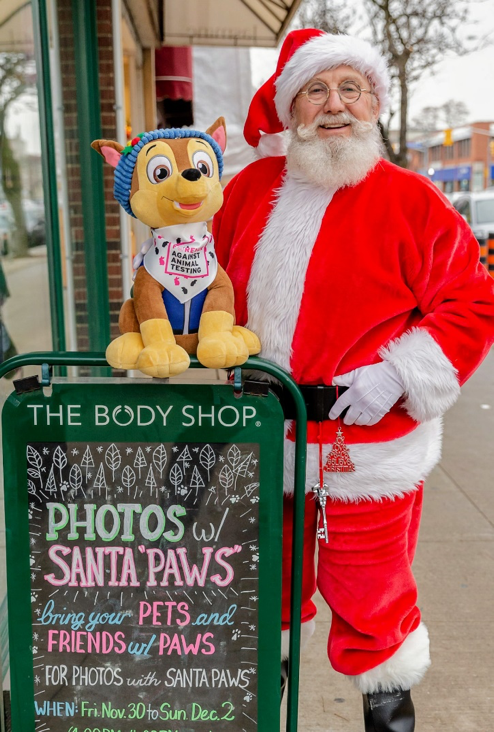 When you’ve been around for as long as I have, you do tend to collect a lot of stuff, especially Santa suits. 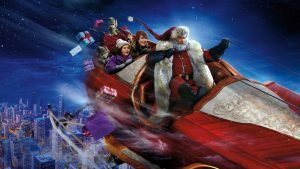 Now I liked how the movie people designed the sleigh. It resembles a classic model Muskoka boat with sleigh-runners. Not exactly my style, but I wouldn’t say no to a ride in it, ho, ho, ho. Most of you will be too young to know what a Muskoka boat looks like, so Elfie; my chief elf suggests you look it up on GOOGLE. That’s it, for now, girls and boys and everyone in-between. 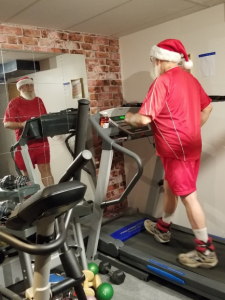 I have to get back to the workshop and maybe even do another mile on the treadmill, ho, ho, ho — fat chance. So be good, kind and respectful of other boys and girls and keep praying for the spirit of Christmas to cover the whole world. It needs it! P.S. We have a new member in our crew now. He can be bashful, but most of you already know him. 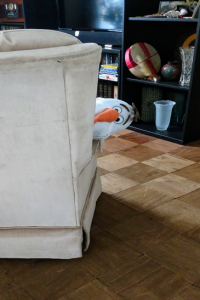 It’s Olaf from Frozen. To all the wonderful children, boys and girls and all of you in between, ho, ho, thank you for your wonderful letters and requests. As you can see, I’m busy reading all of your letters to me. 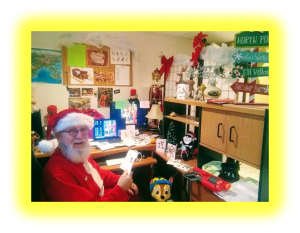 Why, if you look very carefully at the picture below, you’ll see Elfie, my travelling companion elf along with Frosty each reading one of your letters. With so many messages coming in daily, I do need the assistance; what with all my visitations, parades and appearances. And on top of all that, my elves are having me test some of the new toys to make sure they’re not only fun but safe as well. You can see a Mega Nerf gun on my desk. That’s one of my favourites toys I’m testing. 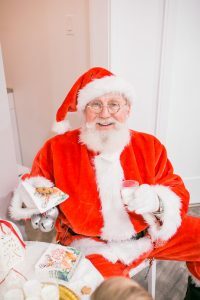 Yes, it’s fun being Santa ho, ho, ho. 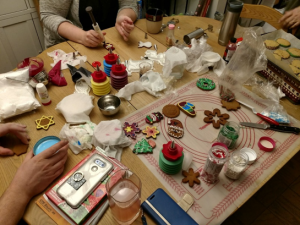 Mrs. Claus and her daughter-in-law Ana, who wants to become a face-painting elf, have been busy baking gingerbread cookies and building gingerbread houses. Why the whole North Pole now smells of sweet gingerbread. 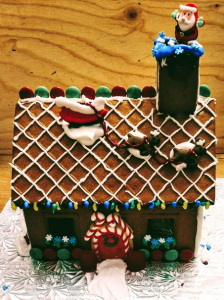 Our gingerbread house even has me on the roof about to descend into the chimney. Ana is very good at details, face-painting and henna tattoos. Make sure to request her for your next occasion. You know what’s makes this season so unique and magical and gives me great joy? This weekend, as I was changing from my driving jacket into my regular Santa coat, strangers who were driving past where I was parked would honk, wave and shout greetings to me as if we were old friends, and truth be told, we are. Now, remember in the last blog I mentioned I have to drive a truck instead of travelling with my sleigh and reindeer. What with all the parades, events and appearances I must attend, if I used Dasher, Dancer, Prancer and Vixen, Comet, Cupid, Donder and Blitzen; and with all the fog of late, I’d have had to use Rudolph as well, they’d all be exhausted come Christmas Eve. As for a reason I wear a driving jacket – yes, it’s red – it’s because I travel incognito, so I won’t be recognized on the highways or streets causing a distraction and possibly an accident. * Now on a serious note: some of you children request things from Santa that I can’t give you. It’s not that I think you were naughty, or that I can’t give them to you, it’s because some requests require lots of responsibility; like getting a new dog or other pet, while some lack a little more maturity – you need to get older – to truly appreciate the gift. There’s nothing sadder than a gift given in love that’s ignored or abandoned a short time later. And of course, some gifts are not practical for you to receive, at least not at this time. So, don’t be disappointed if you don’t always get what you want. Sometimes it’s better to get what you need. Remember what the true meaning of Christmas is all about. “People caring, by their sharing, give to those without. Peace to all men, we’ll understand then, what Christmas is all about. 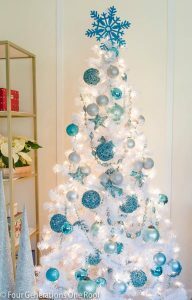 That’s what Christmas means, every year to me, Celebrating Christmas because of, the Nativity”. 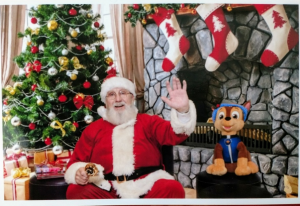 So, until my next blog; you better be good, you better watch out, you better not cry, you better not pout; because Santa Claus…that’s me, is coming to town. That’s why!